This project was part of Mueller Europe restructuring of operations in the UK with the redistribution of some of their process lines from the Northwest operations to their Bilston plant in the West Midlands. Privilege Construction were appointed to carry out the design and build of the proposed foundations and associated works. 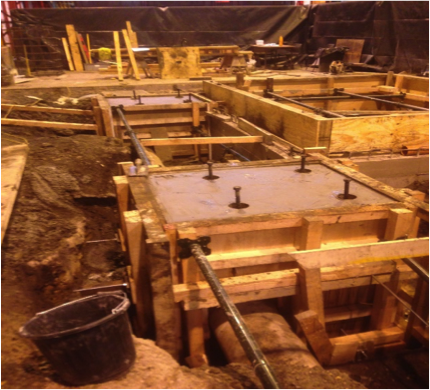 We assisted with the overall planning of process lines and at pre-construction stage carried out various investigations of existing services, ground conditions, structural steel frame and previous foundations. 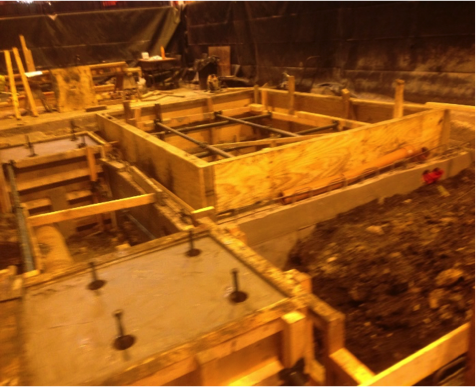 On completion of the detailing process machine layouts we designed the reinforced concrete foundation beds inclusive of all the service ducts, mechanical pipework, various plinths and bolt boxes. Prior to commencement of the main Schumag foundation works we had to remove 2No main frame structural steel columns which supported the existing overhead cranes. We designed the new support framework to work as temporary works whilst we installed the new columns and associated trussed frames. The works were planned so that we had negative impact on the crane operations and as such the cranes remained in full production. On completion of reinforcing the existing foundations the new structural steel frame was installed which also supported the two storey conveyor system. During this stage we also diverted an existing 450mm storm drain which was planned so that the existing system remained live whilst we installed the new sewer and manholes and diverted the run without any over-pumping. Schumag Foundation Drawing & Finishing Line. The reinforced concrete foundation works had to be phased so that we completed the works as we progressed. Due to the restricted headroom and the working area bounded by current manufacturing processes the excavation operations were conducted by a line of 3ton mini-diggers. As we reduced the ground down to its forming level we then had to construct the bases, beds and pits in sections and then repeat this operation over a four phase system till we worked our way out. All materials had to be craned in and all concrete operations were pumped as works progressed. On completion of the foundation works the Schumag production process lines were installed, lined and levelled and we then grouted all the holding down bolt pockets and bases plates.